The Buyer: Mr. Patrick Quinn was most recently the COO for Major Brands, the largest distributor of alcoholic beverages in the state of Missouri. During his tenure Patrick enabled the company to double revenue at increased EBITDA margins while also modernizing systems. Following his resignation from Major Brands, Patrick sought to build his own holdings with the help of DVS.The Seller: Universal, Inc. 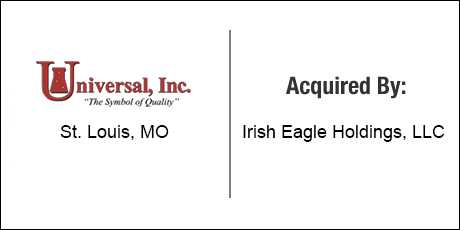 The Seller: Universal, Inc. has been blending the finest chemical specialties since 1978. An investment in a variety of in-house support facilities ensures great quality control within their products. A superior chemical research staff is continuously striving to meet its customers’ unique chemical needs and Universal’s sales force, made up of the most knowledgeable in the industry, allowing them to achieve great success in providing customers with a wide range of solutions for their specialty chemical challenges. The Close: Universal’s two owners had different timetables for exit and sought a buyer who could accommodate their plans. Patrick’s experience in distribution made him an ideal buyer from a succession standpoint. DVS was able to structure a transaction that allowed the sellers to achieve their objectives while also leaving ample capacity for the business to self-fund its anticipated growth under Patrick’s ownership.